For the beginner: Details of a comet and good and bad observations. Some hints and tips on how to improve your observations. Christopher Taylor contributed an article to the section newsletter which describes how to carry out simple spectroscopic studies of comets. The Edgar Wilson Award was instituted in 1999 for amateur comet discoveries. The 2010 Edgar Wilson Award for the discovery of comets was divided among the following four individuals for three different comets: Rui Yang (Hangzhou, Zhejiang, China) and Xing Gao (Urumqi, Xinjiang province, China) for P/2009 L2 (cf. IAUC 9052); Don Machholz (Colfax, CA, U.S.A.) for C/2010 F4 (cf. IAUC 9132); and Jan Vales (Idrija, Slovenia) for P/2010 H2 (cf. IAUC 9137). The 2011 Edgar Wilson Award for the discovery of comets was divided among the following individuals: Kaoru Ikeya and Shigeki Murakami for comet P/2010 V1; Leonid Elenin for C/2010 X1 ; Michael Schwartz and Paulo Holvorcem for C/2011 K1. The 2012 Edgar Wilson Award for the discovery of comets was divided among the following individuals: Leonid Elenin of Russia, for his discovery of comet P/2011 NO1 on 2011 July 7; Artyom Novichonok of Russia, for his co-discovery of comet P/2011 R3 on 2011 Sept. 7; Vladimir Gerke of Russia, for his co-discovery of comet P/2011 R3 on 2011 Sept. 7; Claudine Rinner for her discovery of comet P/2011 W2 on 2011 Nov. 28; Terry Lovejoy of Australia, for his discovery of comet C/2011 W3 on 2011 Nov. 27; Fred Bruenjes of Warrenburg, Missouri, for his discovery of comet C/2012 C2 on 2012 Feb. 11. The 2013 Edgar Wilson Award for the discovery of comets was divided among the following individuals: Paulo Holvorcem of Porto Seguro, Brazil, and Michael Schwartz of Nogales, Arizona, for their joint discovery of six comets: P/2012 TK8, P/2012 WX32, C/2013 C2, C/2013 D1, P/2013 EW90, and C/2013 G9; Masuyuki Iwamoto of Tokushima-ken, Japan, for his discovery of comet C/2013 E2; Artyom Novichonok of Kondopoga, Russia, and Vitali Nevski of Vitebsk, Belarus, for their joint discovery of comet C/2012 S1 (ISON); Claudine Rinner of Ottmarsheim, France, for her discovery of three comets: P/2011 W2, C/2012 CH17, and P/2013 CE31 (281P/MOSS); Tomas Vorobjov of Bratislava, Slovak Republic, for his discovery of comet P/2012 T7. Those for Claudine Rinner, Michael Schwartz, Artyom Novichonok and Vitali Nevski were "Special Awards" where the comet was not named after the discoverer. The 2014 Edgar Wilson Award for the discovery of comets was divided among the following individuals: Terry Lovejoy, Australia for C/2013 R1; Michael Schwartz, U.S.A. for P/2013 T2 and C/2014 B1; Paolo Holvorcem, Brazil for C/2013 U2; Gennadii Borisov, Russia for C/2013 V2; Vitali Nevski, Russia for P/2013 V3; Cristovao Jacques, Brazil for C/2014 E2. Special Awards were made to: Gennadii Borisov for comet C/2013 N4, which was found in professional capacity; Michel Ory, Switzerland for C/2013 V5, which was named Oukaimeden; Cristavao Jacques, Eduardo Pimental, and Joao Barros for C/2014 A4, which was named SONEAR; Matthias Busch and Rafal Reszelewski for C/2014 C1, which was named TOTAS; Paolo Holvorcem and Michael Schwartz for C/2014 F2, which was named Tenagra. Maik Meyer has a catalogue of comet discoveries. Don Machholz "A decade of comets" gives an account of discoveries between 1975 and 1984, and Don also has spreadsheets giving further information on amateur discoveries to date. He also provide an account of his searching in a message posted on 2008 May 6. 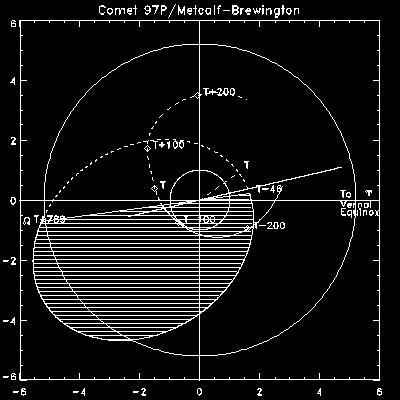 C�dric Bemer notes that the Earth passes 0.005 AU inside the orbit of comet 2006 VZ13 on 2008 May 27.1 (solar longitude 66 degrees) and that there may be a possibility of a meteor shower. The radiant is around RA 330 +16. Interestingly Peter Jenniskens lists the gamma Delphinid shower, which has a broadly similar orbit and is active from June 1 - 20 from a radiant around RA 320 +12. Jenniskens gives a possible outburst on 2013 June 11. The 2007 Orionids gave an unexpectedly strong return, with ZHR of over 50. This section gives a list of helpful urls [Updated 2002 May 14]. The Cometary Science Center occasionally has some news on recent comets. This section gives details of meetings that have been held, and advance notice of forthcoming meetings. A Section meeting took place on 2013 May 18 in the Humfrey Rooms, Northampton. The video of the meeting is on the BAA web and a write up is in the January 2014 newsletter. There was a joint meeting of the Comet and Asteroid Sections of the BAA on Saturday, 2012 October 6 at Milton Keynes. IWCA IV was held in Shanghai on 2009 July 23. IWCA V was held in Rio de Janeiro on 2009 August 8 with this programme. A pro-am meeting on Comets and Meteorites was held on 2003 May 10. This included the inaugural George Alcock Memorial Lecture, which was given by Brian Marsden. The meeting was held in Milton Keynes at the Open University. Other speakers included Neil Bone, Alan Fitzsimmons, David Hughes, Monica Grady, Andrew Elliot, Iwan Williams, Nick James, Graeme Waddington and myself. Programme. The "Meeting on Asteroids and Comets in Europe", MACE 2003, was held from May 1st to 4th at the Mallorca Observatory, Costitx, Mallorca, Spain. There was an RAS discussion meeting on Cometary Science at the Launch of Rosetta on 2002 December 13 at the Geological Society Lecture Theatre, Burlington House. For more details see the RAS Meetings Calendar. An account appeared in the Aril 2003 issue of The Comet's Tale. The Asteroids Comets Meteors (ACM2002) conference was held in Berlin from July 29 to August 2, 2002. Information on the conference is available at the meeting web site. Notes from the meeting appear in the October 2002 issue of The Comet's Tale. MACE 2010 was held at Visnjan/Tican, Croatia from May 21 to 23. There was a Section meeting associated with the BAA Ordinary meeting on Saturday 2002 February 23, notes from the meeting are included in the April 2002 issue of The Comet's Tale. A recent professional meeting was the "5 Years After Hale Bopp" conference held in Tenerife January 21-25, 2002. Information on this conference is available at the meeting web site. The second International Workshop on Cometary Astronomy was held in Cambridge over the weekend following the total eclipse on 1999 August 11. Details of IWCA2. The 2010 BAA Exhibition Meeting took place in London on June 26. The comet section posters showed the work of the section and highlighted Rolando Ligustri's images. The comet section 'Observing Guide to Comets' (2002 edition) is available from the BAA Office at a cost of GBP 3.50, or at selected BAA events for 3.00. Overseas and UK observers can now purchase items from the BAA Sales desk using credit cards. The Guide describes all the details you need to record to make a scientifically useful observation and also helps beginner observers to locate and view comets. The Section Newsletter 'The Comet's Tale' is published once a year, usually in early January. Only the pdf version is now produced and this is available for download from these pages. The latest issue is 2015 January. Back issues for April 1999, October 1999 , April 2000 , October 2000 , April 2001 , October 2001 , April 2002 , October 2002 , April 2003 , October 2003 , April 2004 , October 2004 , April 2005 , October 2005 , April 2006 , January 2007 , December 2007 , December 2008 , January 2010 , January 2011 , January 2012 , January 2013 , January 2014 and January 2015 are available in pdf format. Earlier issues for October 1998 , April 1998 , October 1997 , April 1997 have been generated as pdf files, but the pagination is no longer correct. The ICQ has published a very comprehensive guide to observing comets, which covers historical observations and theory to degree level. Further details are available from the ICQ pages. This is now out of print, but may be published commercially in the near future. Some recent ICQ articles are published on line. A new initiative springing out of the ICQ is the Cometary Science Center, which in the long term will become a repository for information about every observed comet. Pamphlet on the George Alcock memorial plaque Martin Mobberley has created a web page on George Alcock. There is an interesting perspective on the Kuiper Belt and Comets written by Dave Jewitt. Paper on Caroline Herschel's comets released on arXiv. David Seargent has published an e-book on sun-grazing comets. The Section publishes an annual report each year in the BAA Journal. The following reports are available on line: 2003 / 2002 / 2001 / 2000 / 1999 / 1998 / 1997 / 1996 / 1995 / 1994 / 1993 / 1992 / 1991 / 1990. Some additional historical information about the Section can be seen from this list of Section Directors, Keedy Award winners and Newsletter Editors. This detailed history is taken from the BAA Publications 'The first fifty years' and 'The second fifty years'. The December Journal usually includes an update on the comet prospects for the coming year. Analyses of comets appearing in any year appear on a regular basis. A report on the comets of 1991 appeared in the August 1997 BAA Journal. 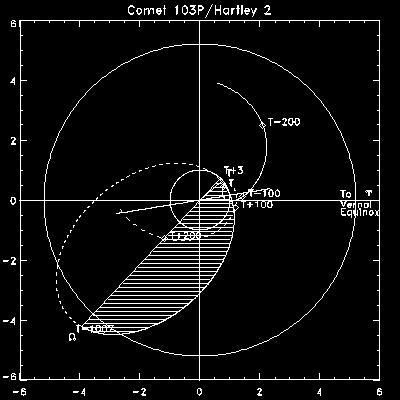 Unfortunately the figures for the orbits of comets 97P and 103P given in the paper are for the current orbits, not as they were in 1991. The correct figures are given in the links above. Comet news for SPA members for 2000 February / 2000 August / 2001 February / 2001 August / 2002 February / 2002 August / 2003 January / 2003 October / 2004 January / 2004 July / 2005 January / 2005 July / 2006 January / [updated 2006 January 23]. Many thanks to those that regularly access this page for your interest. If you have any comments, suggestions for improvement or find any problems, please mail the comet section director, Jon Shanklin, but please make sure that it is possible to reply to your address. If you need to phone me I can sometimes be contacted at home on +44 (0)1223 571250 or my work number is +44 (0)1223 221400. The work fax is +44 (0)1223 221279 I can also be contacted at j.shanklin [at] bas.ac.uk and snail mail will reach me at British Antarctic Survey, Madingley Road, CAMBRIDGE CB3 0ET, England. For information about my old day job I have a web page at BAS.